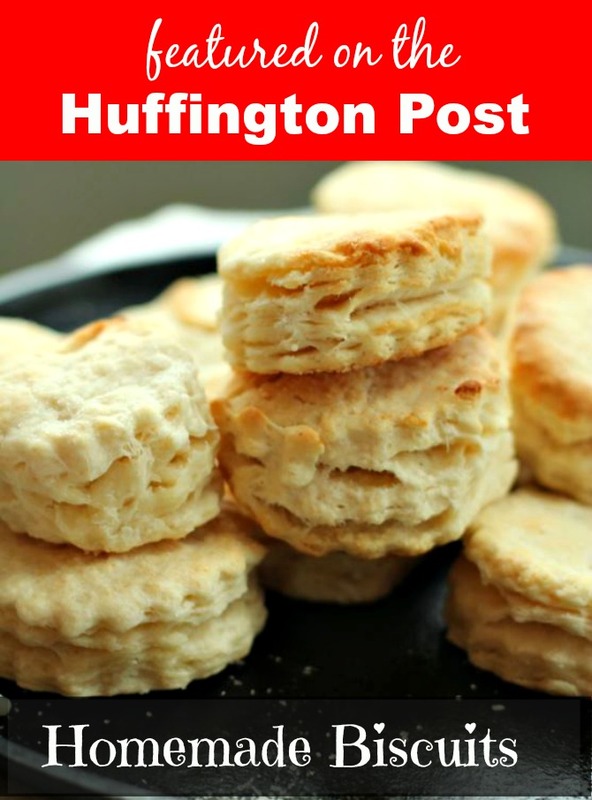 Editor’s Note: Since this post, I have found what I believe to be the best buttermilk biscuit and wrote about it here and included a video tutorial. These are awesome, when you’re looking for flakey. Go to the buttermilk biscuit for fluffy. 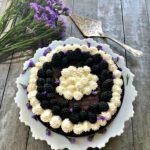 Since writing this post, I’ve become somewhat of a biscuit expert, even teaching biscuits and showing people how to make the very best biscuits for their family. The saddest thing in the history of my husband’s family is the lost art of Southern cooking. The memories of Meemaw and her wood burning stove that turned out biscuits seven days a week is so legendary that no one has dared attempt to compete with her, until now. I never met her. I never ate a single biscuit from the farmhouse, but I’ve heard enough about them to miss them, to yearn for them, and to feel a bit cheated that she got so busy as the boss of her own kitchen, she never took the time to pass her craft down. 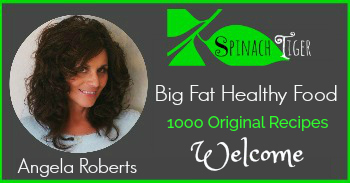 It has taken me nearly 13 years of hearing about her around the kitchen table of my husband’s family. I, too, have had biscuit intimidation. 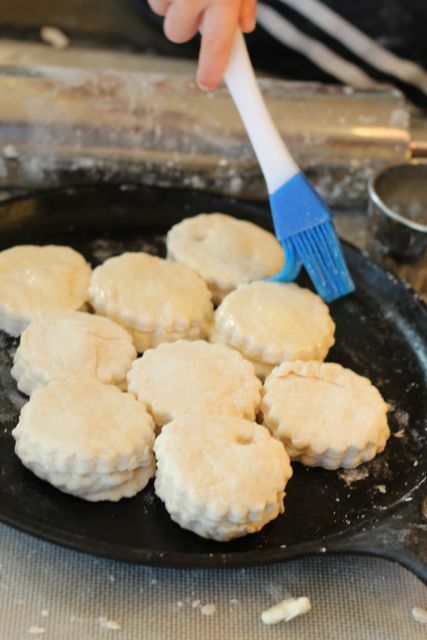 It wasn’t until I was able to master pie crust that I realized I could master anything with flour and with a bit of grit and determination, I have been biscuit making. 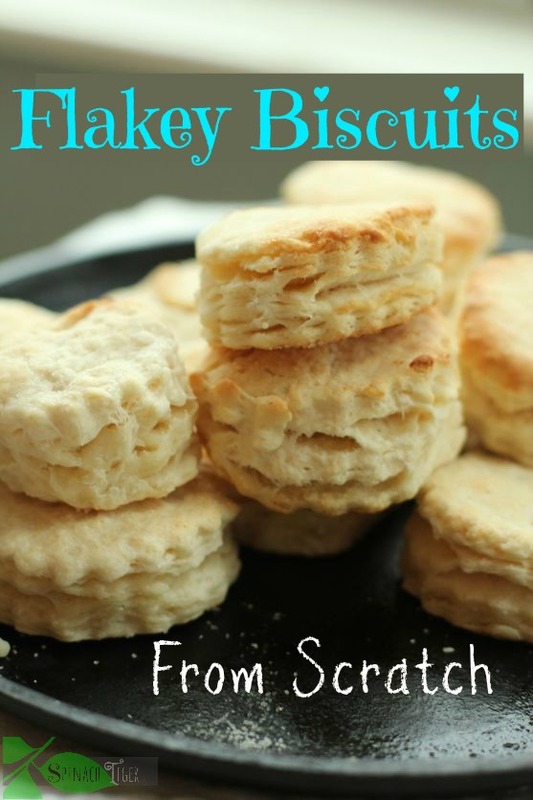 I got this recipe from Maryann Byrd on line and as far as flakey biscuits go, this is great. It was even featured on the Huffington Post. 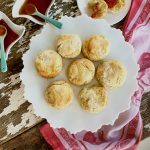 However, I want to make sure you know that over these past few years since I first wrote this post, I perfected the fluffy biscuits. In face, I’ve become somewhat of a biscuit expert, even teaching biscuit making. I made these biscuits with an assembly line of two four-year old boys. One stirred the bowl. I rolled. One cut and handed over to the other one who made sure the biscuits were properly touching in the pan (kissing), and then promptly brushed on the melted butter. We all helped to eat them. I did not have self-rising flour. If you start out with regular flour, you can make your own self rising flour, as I did. I use a wooden salad bowl that I only use for my biscuit making. The dough will be wet, unlike a pie dough. Press the biscuit cutter up and down. Do not twist. You don’t want to seal the biscuit. Brush with melted butter before baking. Have the biscuits “kiss” which means they should touch. It helps them rise. 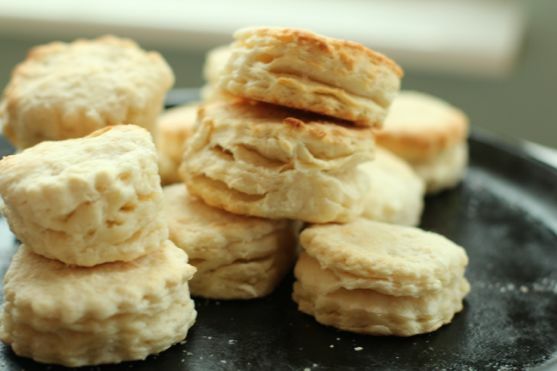 A Southern biscuit recipe adapted from Maryann Byrd's Buttercrisp biscuit. Cut ¼ cup butter in small pieces. Freeze. Separately cut 2 tablespoons butter and keep cold. Melt remaining 2 tablespoons butter to brush on top. If using all purpose flour see notes. If using self-rising flour, add in 1 teaspoon sugar and a pinch of baking powder. Cut butter into flour and add ¾ cup of the buttermilk. You will want a sticky dough, but may not need the full cup of buttermilk. 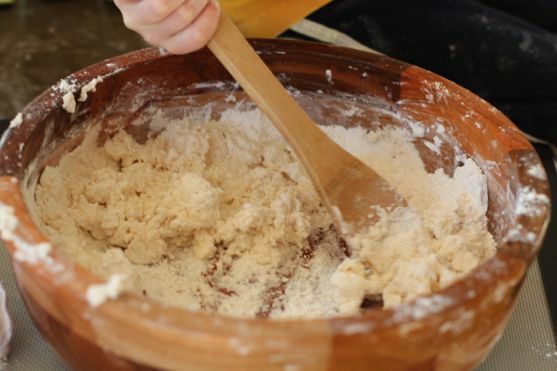 Form into a ball of dough and with some extra flour on your hands, knead dough 6-8 times. Cut into biscuits. Dip biscuit cutter into flour. 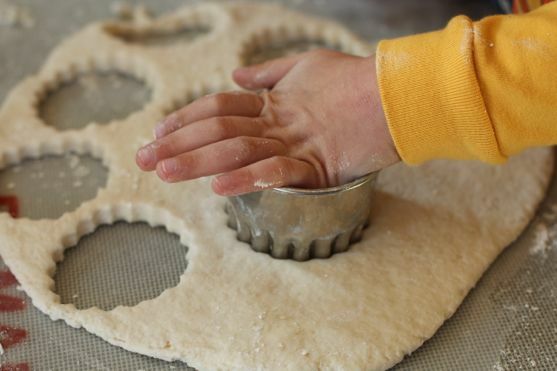 Do not twist biscuit cutter, but use an up and down even pressure. Arrange biscuits on baking sheet, stone or cast iron pan, touching. This helps them rise. Brush with melted butter and bake for 18 minutes. 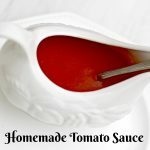 I just tried the recipe! Best homade biscuits I have ever made!! When you bake biscuits on a cast iron pan, do you preheat the cast iron pan in the oven or do you place them on a cold cast iron pan? So glad the biscuit recipe worked for you. Biscuits are tricky and I tried to make it easy for folks. I don’t see the link for the youtube video. When I click where it says youtube video I get a dead link. Biscuits are beautiful. I made these tonight. They tasted good and were flaky but didn’t rise much. I followed the directions for make your own self rising flour. Not sure what went wrong. These are some easy peasy looking biscuits. Love how you have the baby helping you! That makes them taste so much better. This looks like a great biscuit recipe. Love all those layers. I would never turn down a good biscuit Angela. My one and only experience with biscuits and gravy was not a positive one by I know that if prepared the right way and not in a restaurant microwave they could be nothing short of perfect. What perfect looking biscuits. 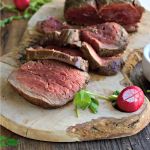 I would love to go to the South and experience Southern cooking – it seems to me it’s great family cooking and wonderful comfort food. Angela, these biscuits look amazing. The flakiness is perfecto! 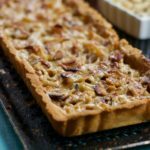 I make various types of biscuit recipes all the time for photo shoots and will add this recipe to my list of beautiful biscuits. Yum. These look amazing. I must try this recipe. They are so wonderfully flaky! A good light and flaky biscuit is such an art. Oh, just the thought of Meemaw trying one of my biscuits makes me blush and tremble. Angie, Now all these biscuits need are that great sausage you served us on Sunday. They look soooo flaky and delicious! Perfect biscuits. 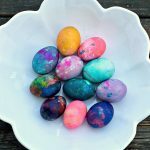 these look awesome, angela! a perfectly-made biscuit can be a hard thing to produce but it looks like you mastered it. i’m impressed! Amy, thank you. Only because I’ve practiced and practiced, so I feel a tiny bit confident.